Welcome to Anton & Associates, Inc. 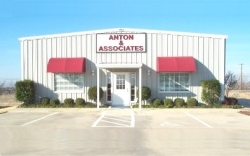 Established in 1982, Anton & Associates serves as an exclusive sales representative for top companies that manufacture factory automation equipment. Our product lines include industry leaders in the fields of part assembly, part handling, product testing, part identification and decorating. Our home office is located in Denton, Texas. Our 5,000 square foot facility features a demonstration lab and warehouse. The in-house lab allows us to qualify and process applications quickly, thus reducing overall response time to the customer. Customers are welcome to visit for "hands-on" product demonstrations or application evaluations.